The church shown here is St Mary Abbots. It was rebuilt in 1869-72 by Sir George Gilbert Scott, but this drawing shows the previous structure. Outside the church is the watch house and the parish pump. 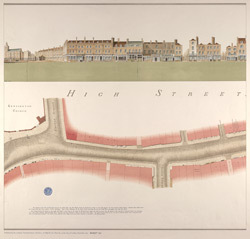 The parish boundary between the Parish of St Mary Abbot, Kensington and the Parish of St Margaret, Westminster is indicated to the far right of the drawing. The way to Clarence House is indicated.